When Should My Child First See Our Alexandria Family Dentist? It’s a question that many parents in Alexandria debate: When should I take my child in for their first dental appointment? The answer may be a little earlier than you think. Some Alexandria area parents may wonder why dental visits are needed so early in their child’s life. Not only will your family dentist want to clean your child’s teeth and apply fluoride, it’s also important for small children to get used to seeing the dentist. Starting early dental visits will mean that later in life your Alexandria child is less likely to require braces or other cosmetic dentistry procedures such as dental implants. If you have a child that is apprehensive about visiting Mt. Vernon Center for Dentistry, you might want to think about bringing them to your next Alexandria dental appointment. 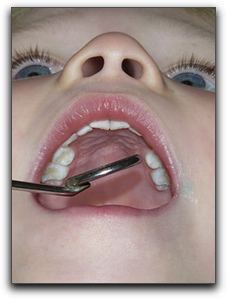 Seeing you in the dental chair will help them become more comfortable with the idea. I’m Dr. James D. Geren, a child-friendly Alexandria family dentist, and I want my patients to have the best oral health possible. I also want them to look their best, so if you have any questions about a smile makeover, give us a call at 703-360-5881. Thanks for visiting our Alexandria dental blog, and contact us today for all your dental needs! Get Your Teeth In Shape, Mt. Vernon!